“They will be running by people’s homes, near schools; it is very invasive, it is going to drastically change the community.” She’s also concerned about the infrastructure left behind “white elephants with transmission lines running down your road” she calls them, should the energy companies pull the turbines out of service. The holdouts, Esther Wrightman contends, are making it difficult for the wind energy companies to site their transmission route to get power from four projects(including Suncor’s Cedar Point project in Plympton-Wyoming and Lambton Shores) onto the provincial energy grid. But Jose Hernandez of NextEra Energy says the company has been working with Middlesex County on the issue and plans to meet with municipal officials in Lambton as well. “The proposal…we are continuing to work towards is the option we’ve shown to the public from the beginning,” she says. She says meetings are planned in Warwick in February on the Jericho project and its transmission lines. Posted on December 12, 2012, in Adelaide Project- NextEra, Adelaide Project- Suncor, Bornish Project, Cedar Point Project, Electrical Pollution, Jericho Project, Next Era, Suncor, Transmission and tagged transmission, wind energy companies. Bookmark the permalink. 2 Comments. With the prorogue of the Legislature and no functional Political Leadership until some time next year, I request Council to urgently consider a Court Order to stop all activities in Lambton County with regards to the Industrial Wind Turbine projects. The electrical energy projects in Ontario are in shambles. There are many more legal/liability problems beside the obvious Gas Plants’ cancellations created by the ill conceived and grossly mismanaged Green Energy Act. A time-out is essential until a credible government can re-examine Ontario’s legal responsibility to its citizens and restore democratic governance. Lambton County must protect its citizens from liabilities generated by a Government out of control and presently on the run from their responsibilities. A $40 million 500MW transmission power project approved by the Ontario Energy Board for Lambton “in the public interest” was over the objection of the native community and many Lambton residents. This project and more to come are not to modernize the infrastructure but are primarily to facilitate the influx of more than 300 industrial wind turbines with a height of 500 feet. Most residents recognize the catastrophic consequence the high concentration of IWTs will have on their quality of life, health, property value, security, destruction of farmland, and the restriction to future development. The adverse effects of IWTs on human lives in many parts of Ontario are well documented: Bruce, Haldimand, Chatham-Kent County – the list is long. There are many victims with heartbreaking stories. 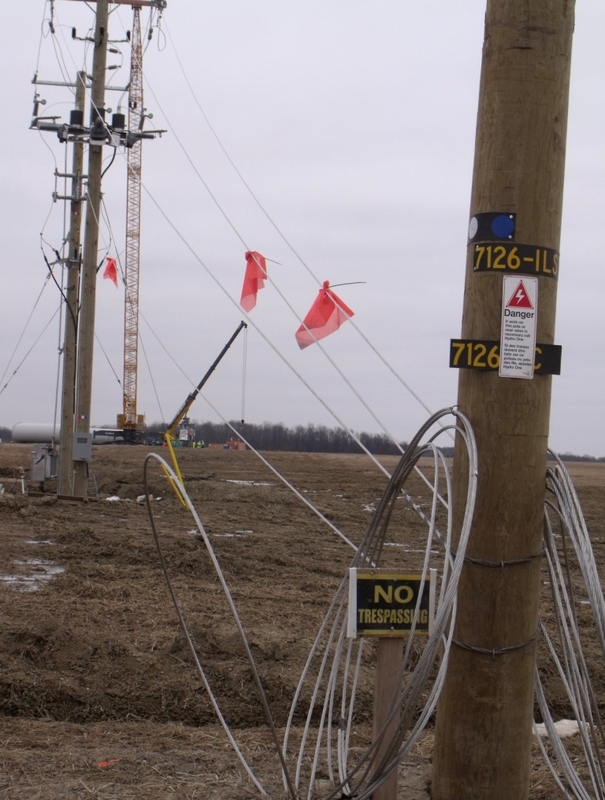 Lambton County must not allow these transmission and IWT projects to proceed. What we have here is a premeditated reckless destruction of Human Habitat unfit for raising families . The Environmental Protection Agency failed Ontarians. 300+ IWTs will cause the biggest environmental catastrophe and social devastation this County has faced and constitute a criminal act against the citizens of Lambton. Respectable corporations and democratic functioning Provincial Government agencies would not destroy the lives of tens of thousands and their land. It is universal knowledge that home invasion, stealing, destroying property and assaulting innocent civilians is attributed to common criminals. None of the claims of a safe Turbine setback under the Green Energy Act can be substantiated under Oath in court. The fact that the Chief Medical Officer would not respond to a court summons to corroborate her claims of safe setback shows the contempt for Ontario’s citizens and their laws and proves the invalidity of her report. All the electric power governing agencies, eg Ontario Power Authority, Environmental Protection Agency, multinationals and even the Courts, quote the CMO report -The Potential Health Impact of Wind Turbines – and are proceeding with their approvals and decisions on the basis of a totally worthless document. The 6500 proposed industrial wind turbines for Southern Ontario will surround farmhouses and residential areas. Our beautiful province will be transformed into an industrial wasteland with many families displaced and many farms ending up in corporate hands, and therefore, more turbines. This will have a devastating effect on rural Ontario’s small villages and towns. The Government’s objective to replace Coal with IWTs is not achievable. IWTs cannot replace Coal. Coal is a base load generation power source with a 100% power output. IWT is only a supplementary power source not suitable for base load generation with a 0.3% to about 25% power output efficiency. These are very fundamental facts. The use of IWTs in southern Ontario is a major Engineering failure to say the least. Besides the technical unsuitability of IWTs in this region, they are definitely unsuitable in peoples’ backyards. Replacement of some coal generation is being achieved temporarily through added refurbished nuclear reactors and a massive amount of new natural gas generation. This temporary state of make believe power security will come to an end soon with the removal of old nuclear reactors and the shut down of all coal plants leaving insufficient base generation. Gas turbine generation must then be massively increased again but won’t be sustainable as an affordable base power generation in the years to come. Remember oil used to be only $2.50 a barrel. Producing natural gas through the fracking process is extremely destructive to the earth and its people. This situation won’t continue forever. Due to the reckless implementation of these IWTs, Ontario’s future electrical power security, and therefore, the future prosperity of the Province was put in jeopardy . People in Lambton deserve to know where their County Council is standing on this destructive life-changing issue for thousands of its citizen. The residents of Plympton-Wyoming have demonstrated their support for their Mayor and Council to keep the municipality free of IWTs with more than 1200 signatures and very large attendance at local meetings. It is time citizens of rural Ontario unite and start legal actions against all the owners of these destructive IWTs. Here are examples of how many IWTs would be required under low output conditions to maintain the presently installed capacity of ~1500MW from 1000 turbines. During the summer months with the highest power demand, the IWT output was somewhere between 0.5% and 10% on the average. An assessment would probably classify this situation as madness. For the past 20 plus years, the Ontario taxpayer has paid out Mega Millions of dollars cleaning up land polluted by businesses of the last 100+ years. After the life of the Wind Turbines, who will be responsible for the cleanup of these ugly structures. Has the Government of Ontario built in a reserve fund or established legal liability for tearing these structures down or the costs associated with the removal of transmission lines to be installed throughout the rural country side? I would like to know what contracts are in place with 100% guarantees that the cost will not be passed to the Ontario Taxpayer and the Wind Turbine companies can’t escape from their legal contract commitments with mergers or intentional bankruptcies.